"We're on Gardner Island. Gardner, Gardner, Gardner!" Re: "We're on Gardner Island. Gardner, Gardner, Gardner!" Ted. This is the first I have read about Dana Randolf. I know sometime in my life. I heard of ship on reef etc. Where can I read about this? I did a search and it only came up with betty's notebook threads and posts. At the top of every page of the Forum, there is a tab called "Search TIGHAR." Inside the page to which the tab leads is a special Google Search box for the TIGHAR website. If you put "Dana Randolph" in the special TIGHAR Google Search box, you get 79 results. All of those results are references to "Dana Randolph" on the TIGHAR website. How does one go off into the night, searching for a sliver of land that means your life, without knowing how to use or verifying the reliability of the one piece of equipment that is essential for finding that sliver of land? How does one set off to fly around the world in 1937 without knowing Morse code? Neither is rational and yet we know she did both. I agree 100%,.....I believe when asked a similar question by someone , she responded " Why do I need those things? I have a navigator" ....or something to that effect. This one seems the clearest, and one can make out various cities in the legend. "...Fred did not plot routes all across the Pacific. Fred worked only for Pan Am and only on the route across the North Pacific. His experience as a mariner was confined to the Atlantic and South America. Even if officially accurate charts were not yet available, wouldn't somebody like Fred have to know where the islands were and their proximity to each other? No. Officially accurate charts almost certainly were available. The charts he needed were the charts that covered his proposed route. 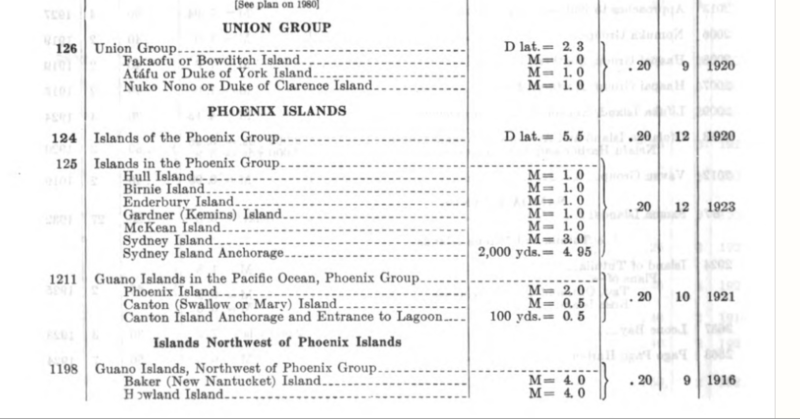 Most of the charts actually used to plot the route around the world were probably ordered directly from the "General Catalogue of Mariners' and Aviators' Charts, Corrected to January 1935 U.S. Hydrographic Office"
under the heading- "Islands Northwest of Phoenix Islands." It has been covered here on Tighar before as well ; http://tighar.org/smf/index.php/topic,360.0.html ....one wonders how much Amelia and Fred knew about the group and their activities on Canton? I was spelling it wrong. Ted had mentioned recordings. That is what I wad asking about finding out about. It does seem there may not actually be any recording though. BTDT, got the scars to prove it. "... Six years later, on July 4, 1937, 16 year-old Rock Springs resident Dana Randolph picked up her distress call on his home shortwave set. “This is Amelia Earhart. Ship on reef southeast of Howland.” Dana reportedly hollered to his father in the kitchen, “Hey Paw! I got Miss Earhart!” The Randolph family were African American." These “location hearings” all give weight to the TIGHAR hypothesis of Niku being the place of landing. "That’s the Pitcairn PCA-2 Autogyro AE flew across the country in May/June 1931. Six years later, on July 4, 1937, 16 year-old Rock Springs resident Dana Randolph picked up her distress call on his home shortwave set. “This is Amelia Earhart. Ship on reef southeast of Howland.” Dana reportedly hollered to his father in the kitchen, “Hey Paw! I got Miss Earhart!” The Randolph family were African American." I wonder if Dana and/or his father went to the airfield to see Amelia when she came through in 1931. The guy on the extreme left in the photo could be African American." It seems that AE did not know the name of the island. However, if Dana Randolph’s recorded transmission is accurate AE describes her location rather accurately – “ship on reef southeast of Howland”, the “281 message” (north to Howland), “figure 8 island”, etc. Marty, I think that Craig's question comes from a misinterpretation of a phrase elsewhere in Ted's post. Craig, "recorded" in this case merely means that Dana Randolph's report of hearing something was written down ("recorded") in a newspaper ... Not that what he heard on his radio was saved on some kind of electronic device. I was searching the thread for "recording." Yes it was the recorded statement.